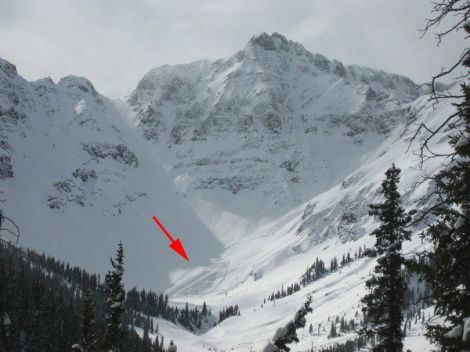 Not that we ever doubted the rumors of Shaun White having a private halfpipe hidden deep in the Colorado mountains, but with the recent pictures floating around the web, that rumor is now confirmed. The pipe sits at an elevation of 12,300 feet, making it the highest pipe ever. It cost over $500k to construct and was funded by both Red Bull and Oakley. 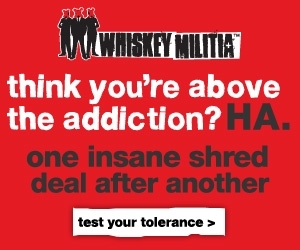 No surprise that Red Bull is behind something like this. 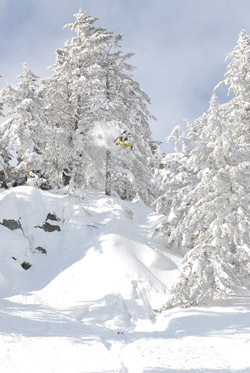 Red Bull has also rented Shaun a house in a nearby town and pays for a heli to transport him up there everyday. Not to mention covering the cost of avi control (take a look above the pipe). Apparently the pipe is open to all Red Bull and Oakley riders, not just Shaun. The other day when we wrote about Shaun White making an estimated $9 million per year, we apparently were only telling half the story. The number is obviously a lot higher when you consider all the amazing perks he gets. Between the house, the pipe, the heli trips, and avi control… that alone has gotta add at least another milli for Mr. White. 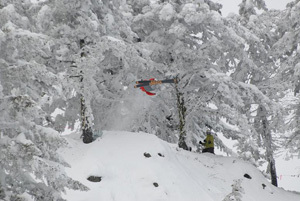 Forget being a pro ball player, becoming a professional snowboarder is the new dream. 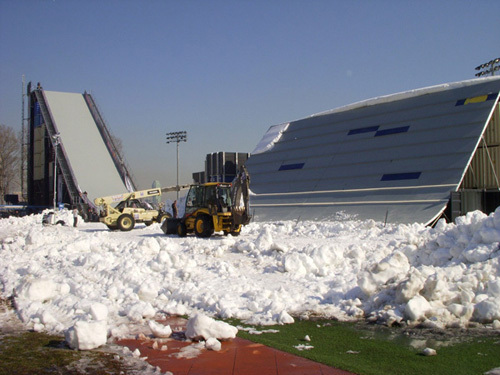 Red Bull has once again taken things to another level with the much hyped and anticipated Red Bull Snowscrapers that’s set to go off tomorrow in New York City. It’s something you don’t want to miss so here are several ways to catch it– If you’re in NY, go see it live. Otherwise, Fuel TV is webcasting it live in HD, you can watch it on the Red Bull webcast, or if you have DirectTV you might find it on MSG TV. It will also be rebroadcast on NBC February 15th. 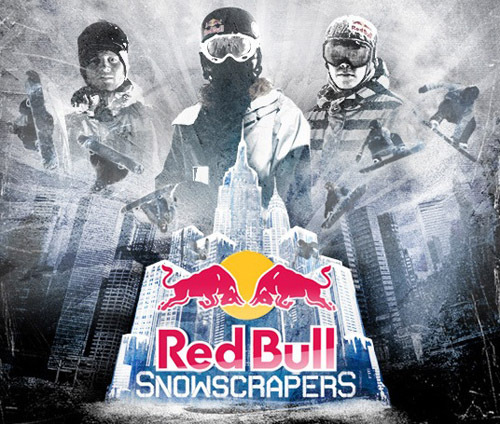 On Thursday, February 5th, 16 of the world’s best snowboarders will compete for their piece of the massive $100,000 prize purse at Red Bull Snowscrapers. Athletes will compete against the majestic backdrop of the New York City skyline in the East River Park from 6-9 pm. The local thrash heavy metal band Anthrax is set to perform. Travis Rice and Shaun White will both be throwing down for the hundred-gees as well as many other rippers, including: Pat Moore, Terje Haakonsen, Kevin Pearce, Danny Davis, Jake Blauvelt, JJ Thomas, to name a few. The jump is a step up hip, set against the backdrop of Manhattan. It’s a jam session, which is defo the way to format a comp like this one. Instead of being judged on the best of a couple runs, the riders will be able to throw down as many runs as they can squeeze in. The rider who impresses the most, wins. We’re big fans of these creative and progressive events that Red Bull consistently puts on. They do an awesome job at pushing the limits, blowing minds, and bringing huge exposure to our sports. 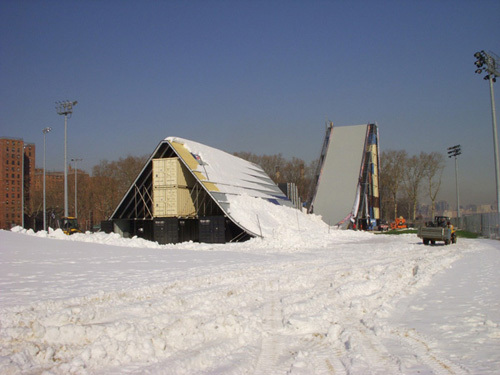 This is the first time snowboarding at a level like will be seen in NYC so huge props to Red Bull for making it happen. The 2008 season of Red Bull Manny Mania had their finals a week ago and the results are is as follows. Joey Brezinski tore it up and so did Brandon Beibel. Stevie Williams should have placed higher though as he was unleashing trick after trick and doing each one pristinely at that. I absolutely love this contest, it’s one of my favorite contests to watch throughout each year. It’s so unique and different from everything else out there and the skateboarders that show up are always a rare group of elusive pros that we would love to see compete but never can. This contest brings out some of the greatest street skateboarders in the world who have their balancing skills up to that magical level. One massive question pops up in my mind about this year’s contest though – WHAT THE HECK HAPPENED TO THE AM STOPS!?!? I only saw three on the website, last year there were like 4x that many stops, not to mention the finals didn’t come ’til the end of all the stops. There are a lot of top notch Amateur technical skateboarders out there that are just as good as the pros and ready to show the world what’s up. I really feel it would have been awesome if they would’ve had a bunch of Am stops beforehand. Not only that, but to have the Am winners show up to the pro contest and see if they could have taken the gold themselves. I could totally see it happening. Sort of like Alex Mizurov did with the Es Game of Skate. The random Am taking the first place in front of all the pros… Do you know how awesome that is? If that doesn’t inspire kids then I don’t know what would. Plus, that amazing course alone would inspire me to skate hard. The course was a perfect blend of ledges, manual pads and boxes. Simply stunning and exactly what I would put in a training facility if I ever so had a miracle of a chance to have. Oh and one last thing I would like to add; Where in the world was Daewon Song? No invite? It would be sweet to see Daewon Song, Chris Haslam, and Ronson Lambert added to next years lineup. That would really spice up the competition. With a hyped swell living up to everything it was expected to be and then some, Durban’s Grant ‘Twiggy’ Baker surfed his way to becoming the 2008 Red Bull Big Wave Africa champion. Dungeons was at it’s finest for the fourth running of the event in it’s 10 year history, hurling massive 15-20 foot waves at the international field of competitors. “I don’t know if you guys watching know how big the waves were out there,” said Baker from the podium. Although the fans watching the event may not have known just how big it was out there (especially those trying to follow the event via the very poor webcast), Hawaii’s Mark Healey and South African Jason Ribbink surely did as Dungeon’s sent them away with parting gifts on the form of a blown eardrum for Healey and a concussion for Ribbink. Wave of the day honors went to San Clemente, Ca. surfer and former event champion Greg Long whose 10 pt. 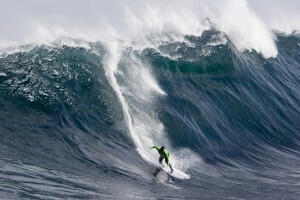 bomb was called “undoubtedly one of the best waves to be ridden at Dungeons,” by webcast commentator Richie Sills. 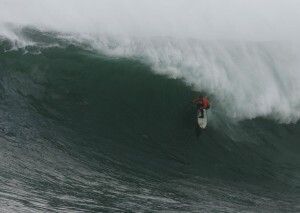 Congratulations Grant “Twiggy” Baker, the 2008 Red Bull Big Wave champion!! With a massive west swell beginning to cooperate beautifully, the 2008 Red Bull Big Wave Africa has officially been placed on Amber Alert. Riders have been placed on notice that the event, which is now in its 10th year, is likely to start within 24 hours. This huge news as the event has only been run in 3 out of it’s previous 9 years of existence. Red Bull isn’t big on compromising the standards they have set-up for the event. If this swell builds and holds as expected, compromising their standards won’t even become an issue. With the swell building throughout today it will give the surfers who are assembled in Hout Bay harbor waiting in anticipation for the event their first official Red Bull Big Wave Africa 2008 practice session. Many of the international competitors only surf Dungeons once a year or so. The practice session is set-up to give these guys a chance to get their feet under them before the competition officially starts. With some of the world’s best big-wave riders set to charge massive mountains of water in South Africa, this is an event you’ll definitely want to check out. It will be webcast for the first time this year so check it out at www.redbullbwa.com.